OREweb.ca® Equipment Maintenance Packages are available for specific parts or service replacement only on the applicable model they pertain to. All maintenance packages include parts and written / photographic instructions for replacement. If you are having difficulty with any parts replacement, please contact us by phone for assistance. This 98M / 93M maintenance package includes the upper feed tray feed wheel and paper separator pad replacements (normal wear parts). 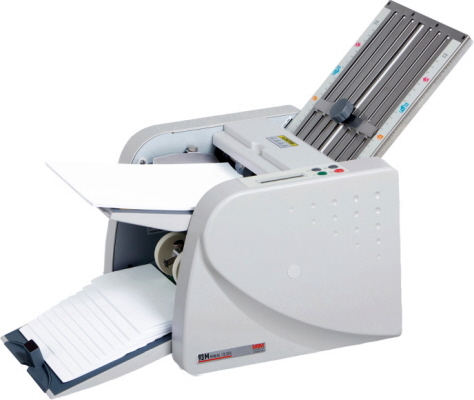 Yearly replacement is required for most offices doing between 1 to 100 sheets of folding per day. Higher volume of folding may require these components to be replaced more often depending on your folding volume. It is highly recommended to keep at least one back-up maintenance kit on hand should you start to encounter mis-feeding of flat stock paper through the top feed tray. The feed wheel and paper separator wears over time with use. Mis-feeding is caused by these two parts. Roll Rejuvenator / Cleaner Spray cleans and conditions the internal rubber rollers. Available in 2 can pack. When folding digitally printed stock, toner, ink and paper debris builds up on the internal rubber rollers over time. Paper jams can start to occur anytime as a result depending on your folding volume. Specially formulated as a non-abrasive cleaning agent this spray also de-glazes the internal rubber rollers with-out damaging them to eliminate internal paper jams. The use of other products for cleaning the rollers can damage the finish on the rubber rollers by drying them out.